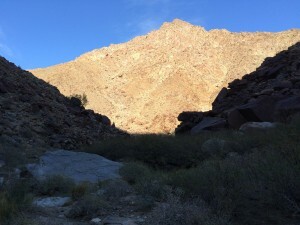 Looming above the family friendly campground at Borrego Palm Canyon is one of the gnarlier class 2 scrambles in the desert. 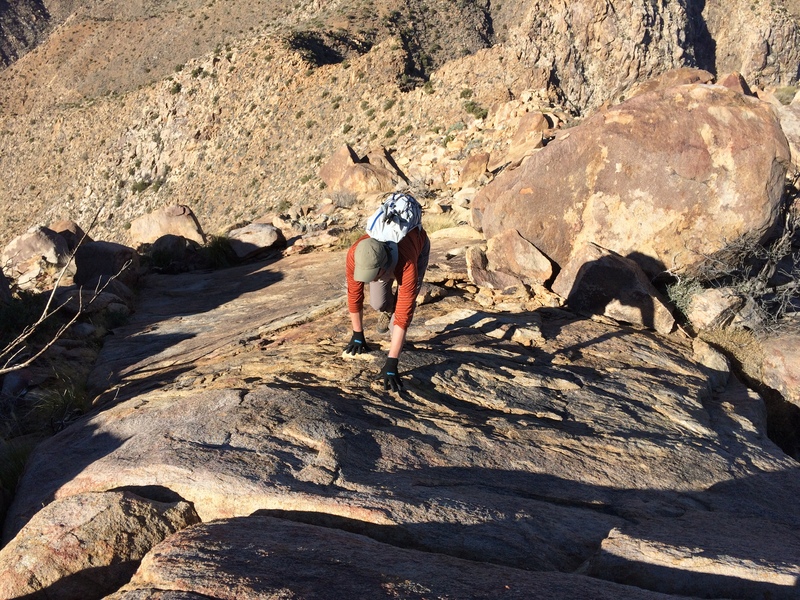 Spend a day dodging cactus and picking over boulders up one of the classic Borrego peaks. Park at the day use area of the Borrego Palm Canyon campground and hike up the well-marked trail into the mouth of Borrego Palm Canyon. The second palm grove marks the terminus of the official trail, continue up the canyon, crossing the stream multiple times until you reach the third palm grove. This section is pretty straightforward, follow well-tread footpaths but there is no official trail. Lots of flowing water and big pools of water here. At the third palm grove, gain the ridge coming in from the north and begin climbing over steep, loose dirt slopes and mostly small boulders, loose rock, agave and cholla. Eventually you will reach the saddle which is a good spot for a break. From here simply follow the main ridge east towareds the always visible peak. 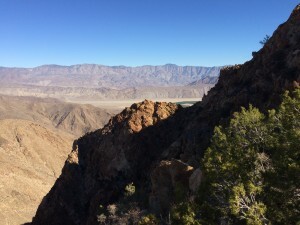 This section has the best scambling as the boulders are larger and there are some fun slabs to climb all the way to the summit which offers lofty views of the Peninsular Ranges, Borrego Valley, San Ysidro Mountain, Santa Rosa Mountains, and Salton Sea. Return via same route, taking care of the loose rock and sandy dirt. For most this trip will take 7-9 hours. Pack water as there is none once you leave Borrego Palm Canyon. There is no trail, this is a cross-country trip, so expect loose rock, pointy cactus, and some varied class 2 and 3 terrain. Route finding is pretty straightforward as you can see both your objective as well as your line of descent from everywhere on the route. Hardy adventurers can continue north on the saddle towards San Ysidro Peak and Hellhole canyon and bag multiple benchmarks along the steep, rugged ridgeline. 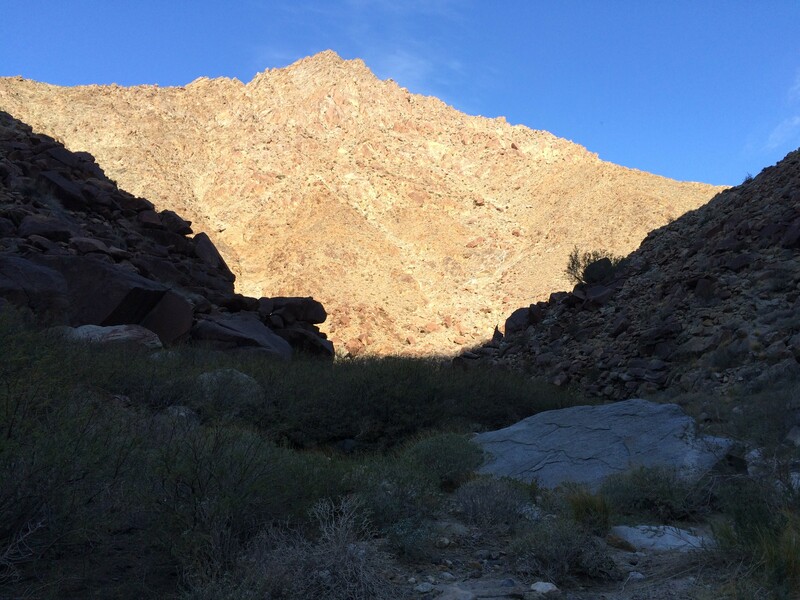 This entry was posted in Hiking on December 26, 2015 by Sassberto.